A few months ago we visited the community of Bain de Laurance because we wanted to check in with the 2 CAF groups and our local AC’s Edvie and Regina. We were guided in this trip by our veteran Regional Coordinator Elizabeth Attilus, who was born in the community and is well known by all the neighbours. She welcomed us at her house and cooked a delicious Haitian stew for us. The first thing that comes to my mind when I think about Bain de Laurance is the road to get there. The community is relatively large and is located between visibly deforested mountains, a very common landscape in Haiti. The steep road to arrive there is more of a combination of yellow looking rocks with deep canals created by water in the ground. We were lucky that it didn’t rain, because when that happens the rocks are slippery and the motorcycles (the only vehicles able to conquer the road) are not able to climb or descent the hills. Naturally, the difficult access to the community makes the life there expensive and challenging. People need to walk miles to buy basic supplies and the products that are sold to them come at a very high price due to the difficult access. Here even the easiest tasks are hard, but they are mountain people, and are used to endure even more difficult times. The second thing which I remember from this trip is the morning. Elizabeth’s house is located in the city center right across from the church, which gave me a very good view of the community life. Being at a high altitude, the temperature droped a lot during the night and when the morning came we woke up in a misty atmosphere where the sun was trying to find its way through the clouds. Once I stepped out of the house I noticed the large crowds of all ages with 5 gallons buckets, forming a line next to the well. Soon the water came and one by one they filled their buckets. With no effort they placed the heavy buckets on the top of their heads and headed back home on the tough road. As I could see for myself, access to water of any kind is extremely difficult, not to say to clean drinking water. If in Ouanaminthe it is easy to buy purified water, in Bain Laurance this option hardly exists. Nowadays, people who drink the water from the well may expose themselves to stomach related problems. 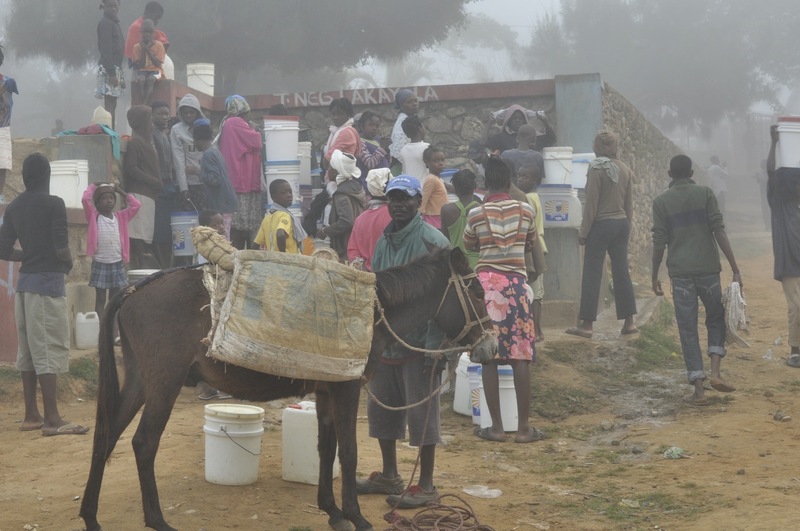 But the situation is not as desperate as it was two years ago, when cholera stroke, favorized and spread due to poor sanitation and reduced access to clean drinking water. Once again this shows why our work is so important. A small solution such as a water filter can make the difference between life and death. Our community entrepreneurs make available to their communities the water filters, and by doing that their are making the life there a little bit easier.